I always love adding a pop of color to a neutral outfit. This pink/coral blazer was the perfect colorful piece to throw over my basic gray tee and black skirt. It's also a nice change from the usual gray/black/navy blue blazers that I seem to live in. I accessorized with my studded Linea Pelle clutch which gave my outfit that edgy touch I always love. Happy Monday! great blazer...love the color, and it's great over neutrals! Love what u did to your clutch. The blazer is such a pretty pink color, love it! LOVE that clutch and nice shoes!! Love the pink blazer against the grey tee, great! That blazer is so gorgeous on you! Your clutch is gorgeous! I love where you took your photos...the landscaping is beautifully done. Love the outfit and that bag is so cool. U look lovely as always kisses from du . Love the colour on you! This outfit is so great I love that pink blazer and the setting is incredible. Beautiful colors! That pink blazer is perfection. I love your blazer. These photos are gorgeous! Love this blazer! Especially with the darker neutrals. Great bag too. this is a great laid back look~! You seriously pull off the casual glamorous look perfectly. I love it! I hope you're enjoying FABB! I absolutely adore this blazer, and it looks amazing on you! I too adore a pop of color... I need more classic pieces like this! What a gorgeous shade! That blazer is great, I love to throw them on over everything! Absolutely gorgeous! The place looks wonderful! Aaahh, this blazer is such a pretty shade of pink! Love it with a casual shirt. Totally in love with that blazer! Such a perfect Spring color! Cute look! Loving that blazer! Such a cute color! love your blazer! perfect shade of pink. Lovely post! I love the location, so gorgeous! 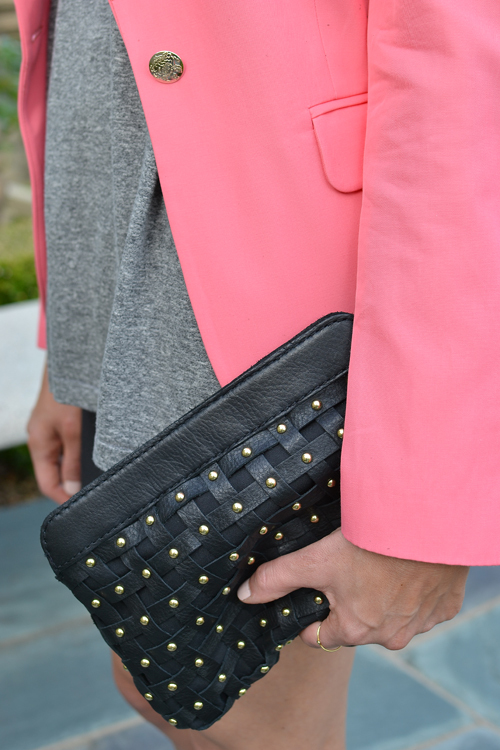 that clutch is lovely, and the blazer is a nice pop of color :) great post! great combo. love the oversized tee with that blazer. you exemplify effortless so well. great location & great outfit.....you rock Audrey! I love the color of this blazer! love the combo of the colors here: the pink with the greys and black... nice choice! Love the light pink blazer on grey top. Cute bag. This is THE coral blazer I have been looking for. It truly adds the perfect punch to a neutral outfit. Love the clutch!And great outfit!Love your style!